Sowood in the 21st century is a delightful village of a couple of thousand people perched atop the Yorkshire moors. Its picturesque stone-built houses and churches give an impression of peaceful permanence; it’s hard to imagine much upheaval being possible in this quintessentially Northern idyll. Precisely one century ago, however, the story was very different – the echo of the first World War’s insane detonation still rang in every ear, and like so many other parts of Europe Sowood and the surrounding towns had suffered unimaginable loss in humanity’s first mechanised mass destruction. The population of these high eyries was then much smaller, little more than farming hamlets with a pub and shop each, yet in Sowood the losses approached almost a hundred servicepeople – virtually an entire generation of young men wiped out. One village street became known as ‘Spinster Lane’ for its especially high proportion of grieving widows. A label made by Sowood WI to guide visitors around the trail. This was the heartbreaking story uncovered by Sowood’s branch of the Women’s Institute when, as part of their preparation for the centenary of the end of the conflict, they began to research the impact of the war on their town and its surrounding area. The WI are a wonderfully can-do bunch, and they began to make plans for a memorial that would gift the people of Sowood real resources for generations to come. 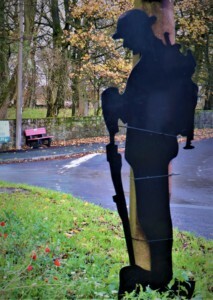 The Unknown Soldier watches over his poppies. Using funds raised from EU pots, local council contributions and yes, an actual jam-and-Jerusalem WI gala, they commissioned a new memorial sculpture for a local park, and life-size silhouettes of the Unknown Soldier to be placed along the routes of four planned memorial walks. 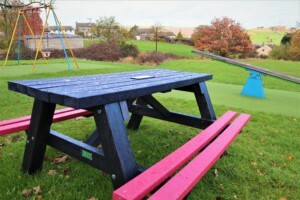 To highlight these routes and give some rest to the walkers, they also came to us to order benches and picnic tables in commemorative red-and-black. 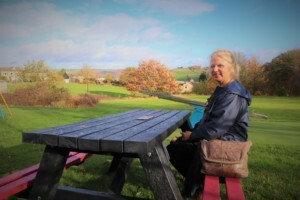 The benches were installed just at the turn of autumn and assembled by volunteers and WI members. 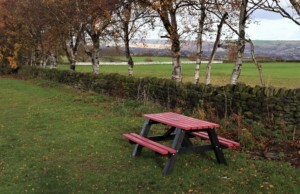 Most were placed at points around Sowood and Stainland where they would provide a welcome break to hikers and residents. Some were also located in secluded and beautiful spots ideal for quiet contemplation or picnicking. Jackie took British Recycled Plastic’s new boy Scott Hutchinson on a tour of the Poppy Trail sites, and he brought back these pictures. 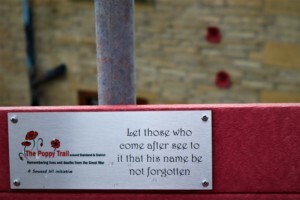 We’re very proud to have been able to contribute our recycled plastic benches to such a beautiful memorial and we wish the people of Sowood and Stainland many happy years of walking and picnicking along their new trails. 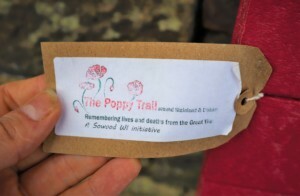 They’re well worth a visit if you get a chance – visit https://sowoodwi.com/poppy-trail for more information on the walks and on the region’s experience of World War 1. 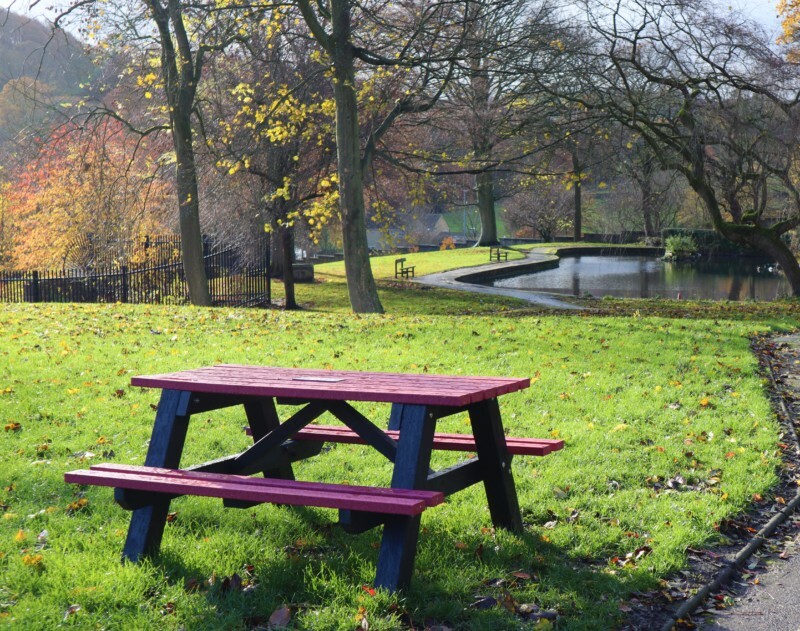 A row of beautiful birch trees frame a secluded picnic table in Sowood.